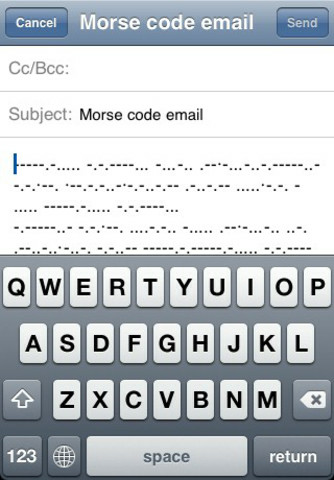 Finally a way to communicate through Morse code on the iPhone! Be it that you are trying to learn this timeless and crucial code or you are an expert wanting to communicate in it… this is the application for you! 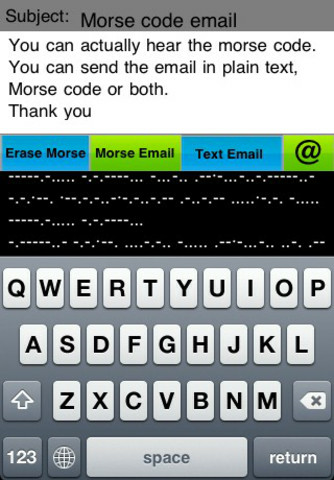 This is a very simple to use application that sends emails with Morse code in it. Using a regular keyboard every time a key is typed, the code’s sound is emitted. As the email is being written, the screen is split so that you can see what is being written in regular text as well as in Morse code. When the email is ready you have three options: send it only in Morse code, only in regular text or both together! This is the perfect application for sending important information without everyone being able to read! It is perfect also for remembering your Boy Scout skills, and have fun with old friends! App supports all letters and numbers. We are constantly working on this and our other applications; please feel free to share with us any ideas or suggestions you may have!